MoeGo is a cloud-based software service provider for groomers, we are available across all major computer platforms (IOS, Android, Desktop App). We know you are multitasking during your work, with MoeGo, you will find how easy it is to simply focus on your grooming work while let MoeGo to streamline your business operations. And we bet you'll never get tried of top-notch customer service. We believe software features won't differentiate different players, but software service does. Pros: The software keeps me and my staff organized better by assigning appointments to certain staff. Allowing me to interchange the appts between staff is a breeze and I LOVE the fact that everyone messages from the same system and phone number so it keeps the communication internal. Cons: As I grow, I find the functionality of the desktop version (which i use to manage all the staff from our headquarters) is somewhat lacking. Our hours are 5am-8pm and the calendar view does lot let me see 5am. Also, I have 4 mobile units and 13 staff members and the software shows every staff member every day whether they are "open" or "closed" I have some staff members who only work once a week but show up every day on the calendar view. Since I have so many employees, I now have to scroll left and right to see my appts on a single day, which makes scheduling quickly a hinderance. I would recommend having staff members ONLY show up on days they are labels as open under their staff profile. That way I see the whole day on one screen. Small frustration, since I am at headquarters on the desktop while my staff are out on the mobile app, if I am in the appointment creation screen and anyone messages through moego, it clears out the appt mid-selection. I've learned good and bad times to create or adjust appointments, but its a frustration nonetheless. Overall: By far, MoeGo is a step above and beyond my manual ways of trying to manage my schedule via google calendar excel spreadsheets!! I love the mapping, route, messaging features that allow my staff to do their jobs really well. From a Command Center point of view (using mostly the desktop version), it is seemingly neglected. I've worked my way around it and still enjoy the features it provides. And I know that down the line, update and changes will be made to improve as I've seen in the past. As a mobile groomer, this app is worth more than every penny spent and customer service phenomenal. Pros: They actually listen to their customers, upgrading the software to fit our needs as requested. Saves time with smart scheduling, doing confirmation reminders for you, and condensing everything you need to run your business in one app, which saves you money and sanity. They have different plans to fit your needs and you can switch it up on busier or slower months. 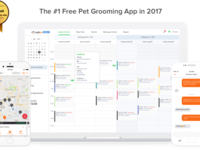 Literally everything is in one place- calender, map/directions, messaging, client info and work notes, invoices made paperless, and now they even offer online scheduling. You have full control of every setting customization. You can also check out reports and charts to help optimize your business. And it will send out a "rate our business" which will direct clients where to leave great reviews or help fix any issues before they become problems. Any mobile groomer is seriously losing out without this program. Cons: My only issue had nothing to do with the software, but more so with me moving from completely paper to technology. There was a learning curve for me, but it's easy to catch on when you get in and pay around on it. They offer to transfer all your client info from one program to another, but mine was only on paper, so it was a long and tedious process to add everyone. Once that was set up, it's been a breeze. There's so much this app offers, I'm sure I don't even use everything yet to its fullest potential. Overall: It saves me time which saves me money. Above all it keeps me organized, professional, and sane! Hi Heather, we will always be your side to help you get familiar with MoeGo! Pros: I bit the bullet and PAID for an app for my mobile grooming business. I'm glad I did! Both the desktop and mobile versions are very robust, but I prefer the mobile version. I like that you can access notes on your grooms, upload a picture of the pet, and add notes to both the record and the individual appointment. I like that you can text or call via the app and the ease in changing an appointment or rebooking is unsurpassed! I'm new to mobile and still filling my client list but I look forward to utilizing the automatic scheduling feature that will locate upcoming appointments in the same area and drop the appointment I'm booking into a slot that makes the drive more economical. I'm sure there will be a lot of data generated once I fully utilize all of the features, and I can't wait to see how my business grows in real numbers! Thanks guys! 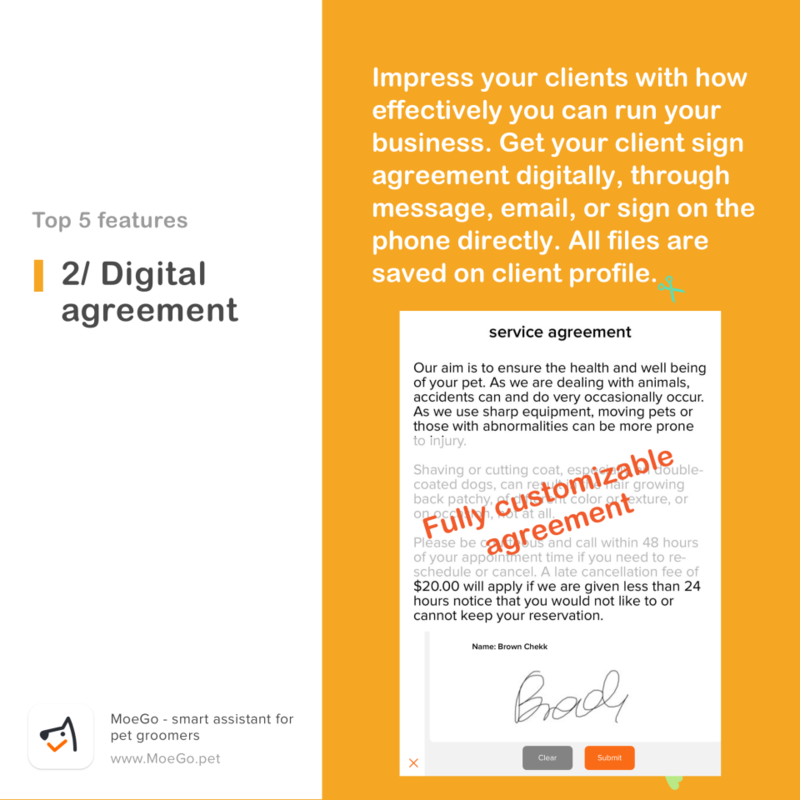 Cons: The desktop version requires appointments to be made for each pet separately, where the mobile app lets you pick and choose the pets from a list, as well as the services each of those pets will receive, prior to setting the date and time and automatically factors in all of the times needed for all services in 1 fell swoop. Overall: it's great for accessing a LOT of info on your clients and their pets quickly. Rescheduling and rebooking are a breeze and the notifications feature is great for keeping clients in the loop. Hi Kay, Thank you for taking your time leaving us a review! We've allocate more resource to desktop product and will make it much better soon to make it as great as our mobile apps! The best mobile grooming software available! Customer support is amazing, they listen to what their users need and accommodate. Cons: I wish there was a space next to the pets name after you check the pet in for grooming notes. Or if whatever pets at that house were selected, the pets name would automatically drop down to the ticket notes for that day. It would help with multiple pet households. Overall: MoeGo has been fantastic. I started my business and initially went with a different software-it was right before MoeGo came out. I tried contacting that company to suggest things that I needed. There was no response. I was using a pencil and paper book and that other software. 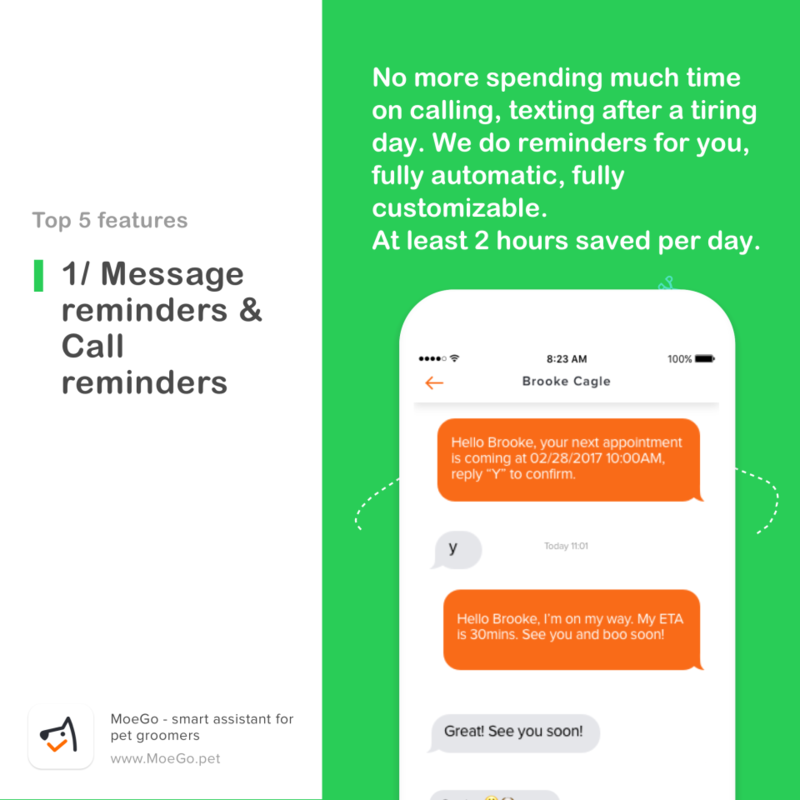 With MoeGo, I was able to ditch the paper book and have everything I needed right in the app. It's very easy to use, you can get directions and contact the clients right from the app. And customer support is amazing. Finally an easy and quick scheduling app for mobile users! Pros: I love this app! I was able to start booking and tracking routes the very first day on the road. Start up was fast and easy. Was able to import contacts and start booking right then. I can move between functions with ease. Was able to book with out a bunch of steps. And being able to send an agreement of polices to be signed amazing! Love this app. Cons: Cell service providers can cause slow downs of app. Bouncing between towers can cause frustration, but that's the same with any app. I would say that there is nothing wrong with this apps programming. Overall: From the start everyone has been prompt and pleasant in answering my questions. The ease of use, time saving. I don't have to do reminder calls and spend time texting the clients of their appointments on my time off. Major organizational and time saving app! Pros: I like I can keep up to date on my schedule and clients wherever I go. My files are with me, I can communicate with my client. I can fill a spot easily if there is a cancellation. I can easily move appointment from one groomer to another. MoeGo is a great choice for Mobile Groomers on the go ! Pros: Ease of use ! I choose to import my customer from my iPhone contact. Then simply add the dog information. Right then you can add an appointment. Checking in a clue is a breeze! Then when you're ready to check out your client simply click "check out". The software walks you through the process. Then you can email the invoice rebook the appointment and ask for review all with a press of a button. Cons: Working with the mapping is a challenge. I've experienced long delays in response to a question, problem or challenge at times. In addition there is a language barrier when it comes to explaining problems, glitch challenge I've encountered. Overall: Overall my experience has been good. Would love to see more in depth "how-to" videos. Sometimes we as users find the answers to our questions via the Facebook users group, versus contacting MoeGo. Would love to have a reward program for enhancements that users suggest, if and when suggestions implemented the user get rewarded with a month or months of subscription fee credits. This fee credit would be based on the value their suggestion has improved or brought ease of use or value to the software end users. The best app for groomers. Now booking is so easy and efficient. 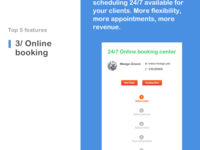 Pros: After using this app, I cant believe how easy it was to schedule my clients. I was able to book clients more accurately. Using there map it shows the distance between each client and about how long the travel time will be. If I am running late or early i'm able to communicate by messenger, with a fast response time. I've been able to book more clients within my day. My clients are happy and so am I. Find clients around with one click. Cons: When you check out and try to reschedule because the customer decided to cancel the appointment at the last minute or for any other reason you need to check out without doing the service and not charging. This happened to me I check in with a customer and he wasn't there so I Check out but I wasn't enabled to reschedule for the next week. Pros: We like MoeGo because of their ability to improve their functionality coming from patron ideas. They are constantly "under development." This shows that the business is investing in themselves. Cons: Is wrong to say that they are always "under development?" There seems to be a laundry list of improvements, and some take more time than other. The payment options should occur through MoeGo. Rather than going out of MoeGo to Square, then back to MoeGo when the client pays. Our Multivan business is posing some concerns with MoeGo. Overall: We would not be as successful as we are without the use of MoeGo. They have helped us understand the importance of routing, rescheduling, and client communication. Pros: How easy it is to find what you need and using that function. 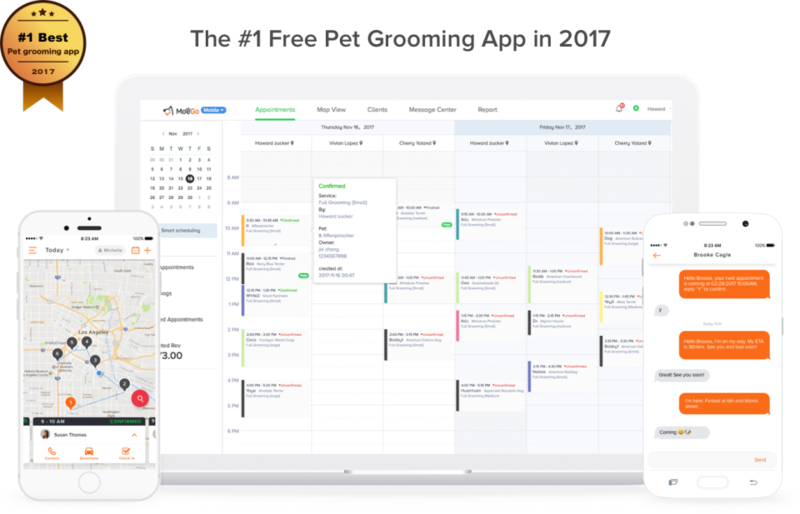 The overall features, making it the perfect dog grooming app. Cons: Not all features on the app, are available in Australia even though we pay the same as countries it does work in. Texting via the app, is available but then you can not utilise all the same in app functions like the 'ask a review' option which has follow up auto prompts. Overall: There is no better app available to use for mobile grooming. Just a pity, we in Australia do not get the same benefits as everyone else. Pros: I really like having my schedule on my phone. I can message my clients to change appointments and it's so easy to use. Cons: I'm not fond of making appointments on the laptop. It takes a lot longer to navigate then it does on my phone. Overall: Overall learning this program was easier than I thought and I like the 24 hour reminder. Extremely quick response from customer service, and an extremely encompassing software! Pros: The software (as it is web driven) works based on your internet connection... however it is extremely responsive, easy to format, intuitive, and easy to use. It is also extremely easy to customize your pricing and services. The rep has been extremely accessible to help me fix glitches etc. which have happened usually largely due to my own error. Cons: Still some growing pains, but the support team is extremely responsive. It is geared largely towards mobile groomers, however, its features tailor easily to storefront. Thanks Chris. Your support will always be our biggest motivation! Pros: I like the reminders, the digital signature for policy forms and the image policy form option. The smart scheduling is a great option as well. Cons: That it does not have income shown for day, week, month and year or sales tax totals for day, month and year. This will be a deal breaker for me if not added. I was told it will be added in. Groomsoft offers this. The reports section in MoeGo is confusing and showing "could be" totals is not necessary. I just want to see my actual torals and sales tax totals to help with tax payments. Already I have to go in and add each sales tax transaction by exporting totals and that will take all day to do. I am very disappointed in the reports section. Also I would love a customer application to be sent out to potential customers inquires, to help rule out if they are a good fit for my service. 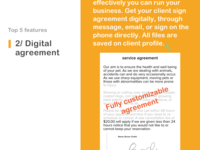 It could be sent just like the the digital agreement. Which "Pawfinity" offers. Pros: I love how the map ties in with shedualing. It makes it so much easier to plan and scheduale the days ahead of time. The automatic reminder for both confirmation and setting up an appointment is fantastic. Amazing! The people behind the app are always there for me! Pros: The people are always there to help me if something goes wrong. They always listen if I suggest something should be added. Also, the app is easy to use and has helped me add so many more clients to my schedule. Cons: My husband thinks it's too expensive, but I understand why it is the price it is for over 100 clients a month. Me personally, I can't come up with anything I dislike. Hi Natalie, you are great! and we are very encouraged by what you have achieved at such young age! hope that we could grow with you for many years to come! Pros: It's a fast download, easy to setup and using the free version really helped teach me how to best use the app features. Cons: I would like to see more options for messaging, like the ability to mass message clients and to delete old messages. And the iPad version is only able to use the monthly view when held horizontal, would be nice to have it available all the time. Overall: I love the quick response to questions and app issues. Customer Service is awesome! I like the q&a/picture feature, just wish more users posted. Pros: I love this scheduling software. It has made my scheduling easy, fast, and reliable. My clients love that they get reminders and I love that the software let's me know when a client has lapsed and I can send them a reminder. It also keeps me in touch with everything going on with my business as my employees can communicate with the client and I can see the conversations going on and correct issues if I need to. It also allows me to make sure my employees are staying on schedule. Customer care is fast and simple as a text or a message to correct any issues i have with the software. I cannot say enough good things. Overall: My scheduling nightmare is over. I used to dread making schedules every year and truly hated rolling into a new year where I had to remake schedules as we gained new clientele. Thanks Tabatha! You are GREAT! Pros: 1) While it doesn't work in the browser (where we do all of our scheduling) just yet and it needs some feature additions we are excited about the Smart Schedule's route optimization potential. 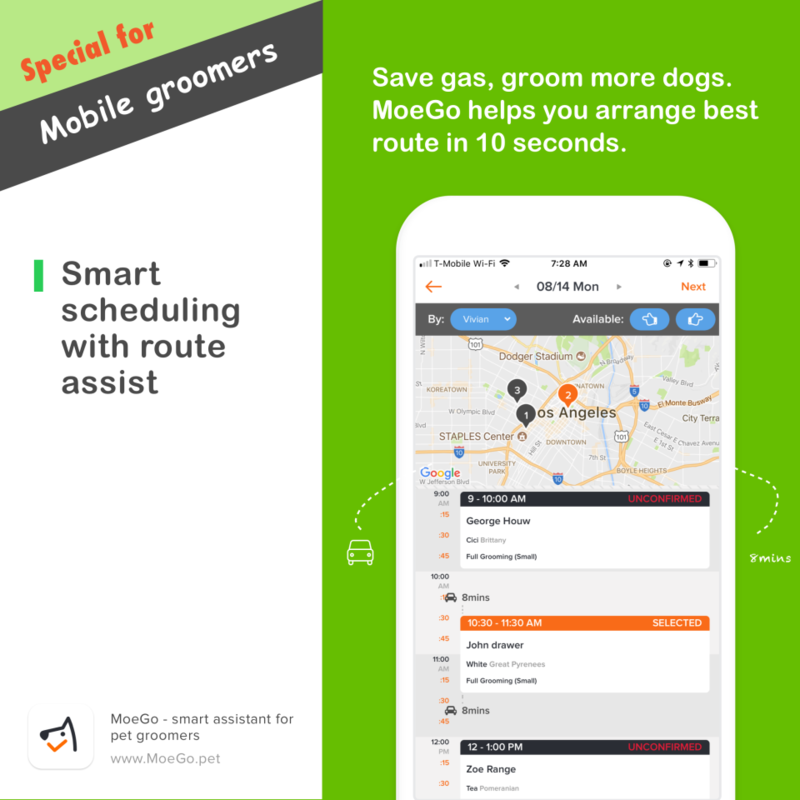 2) The MoeGo team is really working hard on making this the best Scheduling app for mobile groomers. 3) The iOS app is clean and user-friendly. Cons: 1) No open API. 2) CC/Debit processing fees are way to high. 2) As identified via several emails, MoeGo still needs some additional features and refinements before it will be truly beneficial for our team. Overall: Over our current systems, none at the moment. But, we are confident that as app improvements are made and features are added we will see improved scheduling efficiency and route optimization in the near future. Hi Matthis, thank you for your trust! We won't disappoint you! Can't live without this scheduling software! Pros: Super easy to use and keeps all my appointments and info organized. Love the auto message features like the confirmation texts and review message. Cons: A little pricey but worth it! I wish there was an option to turn off payment method since I use square I always have to check out in the app as them paying cash. Happy to see your reviews :) Looking forward to grow with you for many many years to come! Pros: I can set hours for the day. I can make repeat appt., it's easy to make an appointment. It's easy to change appt nice that it sends reminders. It's nice to have customers to be able to book online and less back and forth messages I spend less time returning phone calls and having customers say can you fit me in all my house are close together. Cons: No app for the customer to download. And I would like to set the day by zip code as I'm in a different area every day hopefully soon that will be added. Recommendations to other buyers: Try it I was unsure but glad I did I'm much happier. Very happy I took the leap to go digital with MoeGo. It's so much easier than I thought! Pros: Easy to take care of customer list, GPS feature like Waze. Cons: It supposed to moego random phone number when we call to customer or customer call us. But, all of sudden it shows our actual personal phone number. We contacted customer service and they said fixed it. But, still same issue. For safety and security reason I don't like that. And it needs to fix that issue. Pros: It's very user friendly, customer support is always available, although a few times it's been hit or miss in answering my questions. Cons: I wish there was an optional card swiped and an integrated webpage option. I also wish you could rearrange photos on your gallery. One thing I've noticed is that clients never select a preferred day or time when booking online. I'm not sure if that's something that I have set wrong or what, but I have to send multiple messages to ask them about dates and times. Overall: I'm relatively new to the software, and mobile grooming, but so far the ease of use is remarkable. One thing I'd like changed is more personalized hours of operation. So that when I set up my hours it only shows those hours for me instead of showing all of them. This app works great for mobile grooming! Pros: Makes scheduling appointments in the same area during my days super easy! Also super easy to navigate. Cons: Need a better place to keep gate codes and notes from from previous grooms. They always seem to get erased. Overall: Easier scheduling. Great customer service. Easy customer interaction. Hi Brittney, we are so happy that you love our app! and we will make sure you feel happier in the future! Love Moego. It has helped my groomers and myself keep the routing tight and efficient. Pros: The ability to see the routes and areas we service. Smart scheduling to keep the routes tight and efficient. Knowing who needs appointments and who in the vicinity of a client needs appointments also . Reminder texts. Allowing the groomers to communicate with the clients directly while using a universal number. The ability for both the groomer and myself to see the conversion so we both know how the client responded. Cons: There are small glitches but the support team is right on top of development and changes. Wish list would be that smart scheduling take into account the base of operations (starting and stopping point). Hi Kimberlie, You are GREAT. Thank you! Pros: Great for everyday use for mobile of salon groomers. Especially awesome for mobile groomers as it helps with routing. They listen to what groomers have to say and questions, concerns, and input on what could be better all answered in a timely manner. Cons: Nothing that I can think of at the top of my head. Pros: I love the automation and mapping the most! Overall: I have been very pleased so far. I have been using the program almost a year now. Pros: The software has auto scheduling features which helps me with scheduling my grooming staff. The ETA feature telling the customers when my groomers are coming is a really nice feature. I really like the auto notification features for confirming the appointments. This software has alot of features the other grooming software doens't have. Cons: The Desktop version can be improved on. The reporting feature could be better. Some addresses cannot be found in Google Maps. This may be a limitation of Google Maps. Hi David, thank you for your feedback! The only thing we care about is whether we create value for groomers. and we feel really motivated by hearing what you say! Thank you! MoeGo has Restored my faith in technology!! Finally a secure and easy way to keep business going!! Pros: Love how easy I can figure things out if I just put the time and effort into it! It knows my language! Cons: I can't use it on laptop yet nor Samsung or other phones so my employees can use this app as well. Also when I use the direction button on the God when you arrive the actual number address disappears from the gps. So I have to go back in to see what is the actual address. Hi Kay, Thank you for your feedback. It's been a while from this review, we believe you like MoeGo more since then! I am beyond excited about this app. Has made scheduling, reminders etc etc a snap. Pros: I love that it does all the work I forget to do confirmations, reviews, also shows who hasn't been seen so we can let them know and get them on the schedule. Also the invoice options for clients who need / want a recepit. Customer service is the best I've delt with in a long time. They listen to suggested changes and make them if possible. Cons: I feel there are a lot of extra steps for certian parts of scheduling and entering info that could be simplified. First of all, we are so happy to learn that you love MoeGo!! And thank you for your suggestions. These are very great advice and we will take into consideration to make app better for you and other groomers! Pros: Having all information on clients and daily routes in one place. Multiple van/groomer operation support. 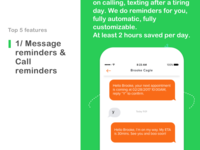 Opportunity to send reminders and communicate with clients directly from the app. Cons: Minor occasional glitches, but not critical, and the team constantly improvs the software. Pros: The staff! They take suggestions and guide the app in the direction we, the consumer, want. Some of the updates have been very helpful. Cons: Smart scheduling. I had high hopes for this but it doesn't seem to work properly a lot of the time and it doesn't actually help you plan a route or make suggestions. Most of the time all it does is give you a driving time between appointments. It does not help with efficient routing the way I had hoped. We appreciate your honest feedback. this is very helpful for us to make it better for every groomers. We will find a time to call you to learn more about your specific needs, so that we could improve our app accordingly. Thank you! Pros: I love the simplicity and ease of use. As well as the mapping and messaging features imbedded inside the app itself. I like how it's professional yet cute with modern vocabulary and emojis. Cons: I would like to be able to copy and paste inside the messaging system as well as send invoices via text as most ppl don't wanna give their email. I'd even be ok to copy and late the invoice in the message within MoeGo. Also the monthly view takes a few taps and could be easier. Also it would be nice if the BLoCK would show what it is versus just saying block on calendar. Hi Lauren, your suggestions mean million to us! Thank you for writing this up! 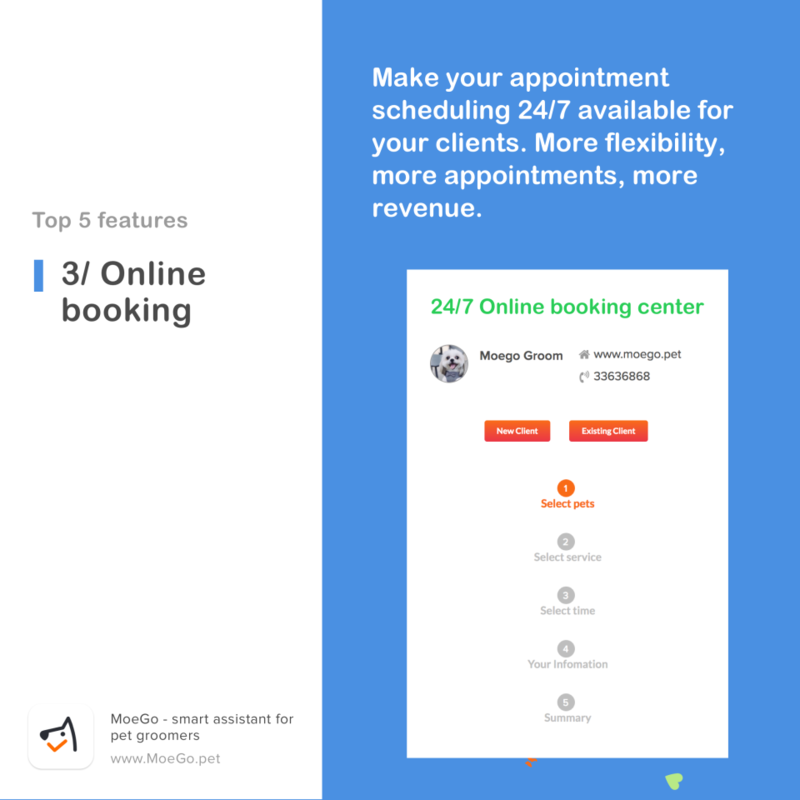 Moego has helped me schedule more appointments per day/week resulting in more income per month. Pros: The smart schedule was the most important feature I needed for my bussiness and has helped me schedule clients closer in location. Also the messaging system has made it easier for me to contact my clients and the automated reminders has saved me time doing this manually. Cons: The only thing that I would think that needs improvement is the rebook option sometimes schedules someone on a new open day rather then scheduling them same day with another client in the same area on that same week. I usually have to do this manually. Great Software - Updates to improve small cons are happening regularly! Slight bugs with different aspects that once fixed would make the app perfect - but nothing that makes the software unusable! Overall: Brilliant. So easy to use and for a growing company its makes everything streamlined as it's all connected and automatic! Customer support has been great - always willing to try to fix issues and add extra features! Pros: I really like how easy it is to use. The customer service is excellent and the price is right. Cons: Reports could be improved but the company really listened to the clients and is constantly adding and developing new features. Overall: I love love love the smart booking. Pros: I love the mapping feature and all of the automated messages/confirmation reminders. Cons: I am just waiting on the Square integration and then it will be perfect. Overall: Customer service is great. They are always improving the software based on clients requests. Cons: wish it was easier to separate employees clients and messages. Overall: Very good. We have tried other software and this one fits the best. Pros: I love smart scheduling, and the ease of using this app! I like the fact that it books according to drive time instead of just placing the client wherever there is an opening. Cons: Sometimes smart scheduling doesn't work the best, and there isn't a place to show who booked the appointment. Hi Shalynne, thanks for your feedback! We used Google mapping API for real-time traffic data, which is probably the best mapping database in the world, and it's getting better and better. 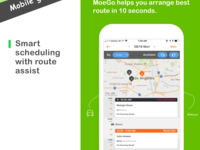 We believe you'll find it more helpful the more you use smart scheduling because our algorithm learns about your routes and will get better and better results the more you use it! Cons: Would like the ability to mark multiple messages as "read" at a time. Especially when several clients are confirming their appointments at the same time. Cons: It's newer, so it has a few bugs, but so responsive and gets it worked out so quickly, it really isn't a con. Thank you Tosha! Glad that you love our app! Pros: Digital! My clients love the fact of reminders and texts. Cons: I wish I could use my own phone number. My clients get confused and it the fact that when you call yoir number ahows up anyways. Pros: I've gone through several software options with only one coming close to Moego. Its so hard to switch over but it is very well worth it! The program evolves to what we want and need. Customer service is always available and takes our suggestions seriously. Cons: Everytime I see a downside or flaw, it's fixed or already in the works before I even begin to question switching back. I do have minor issues about grammar errors, but the program is so great I let it slide. Pros: The customers love the messaging feature. The booking confirmation and the reminders. Having an app. Being able to access phone numbers and addresses quickly. Directions through Google maps or Waze. You can also pull up clients who haven't been groomed for a while in the area your in. Cons: I guess if I had to pick something it would be the price is a little more than I want to pay. But I like the convenience and organization from it. Hi Malinda, we will make sure every penny counts for you! Thank you for your trust and support along the way! MoeGo has been great for my business! Pros: I love the interactive maps. Allows me to improve my routing and save time. I also really appreciate the customer support, MoeGo is always there to answer questions or improve the app. Cons: It sometimes goes a little buggy, but they are so responsive that issues are resolved quickly. Small price to pay for the constant improvements based on customer feedback. Thank you for your positive rating for us! And believe us, we hate bugs way more than our groomer users! Pros: I love that you can send messages through the system. I like that you can color code things. Seems easy to use and learn. I love that you can have the app so you can look at your schedule from home or anywhere. Cons: The set up Is different when using internet, app through Facebook, computer or phone. I don't like how confusing it is for families with multiple pets. Overall: We are having less no shows due to the reminders and being able to send messages through the system. So far it has been good for the price.